From the steamboat era to the trucking age, African-American hourly and day-wage laborers gathered here in an unofficially sanctioned ganging place. Nashville's waterfront was long the site of industrial and mercantile work. From the age of steamboats carrying goods along the Cumberland River in the 1890s, Nashville's industries relied on cheap, unskilled labor to move mercantile goods. This need was largely filled by African-Americans who were kept out of more lucrative and steady skilled jobs by racially oppressive measures by Nashville's labor unions. Many of these workers had migrated from rural parts of Middle Tennessee seeking opportunity when farmland became too expensive relative to farm income. This was a small, but significant part of what’s been called the Great Migration of African Americans from the rural south to urban centers starting. In 1936, a reporter from the Nashville newspaper, the Tennessean, reported on the oldest known site where day laborers collected and managed what he termed a "self-run employment agency." This location was at the corner of First Avenue and Broad St. The other site was on the other side of downtown at the Church and Tenth Avenue. While waiting to be picked up for work, laborers might partake in lively political debate, which according to the journalist Cecil Jones in 1936, revolved around labor rights and politics. Workers were variously skilled in things like carpentry, mechanics, and gardening. 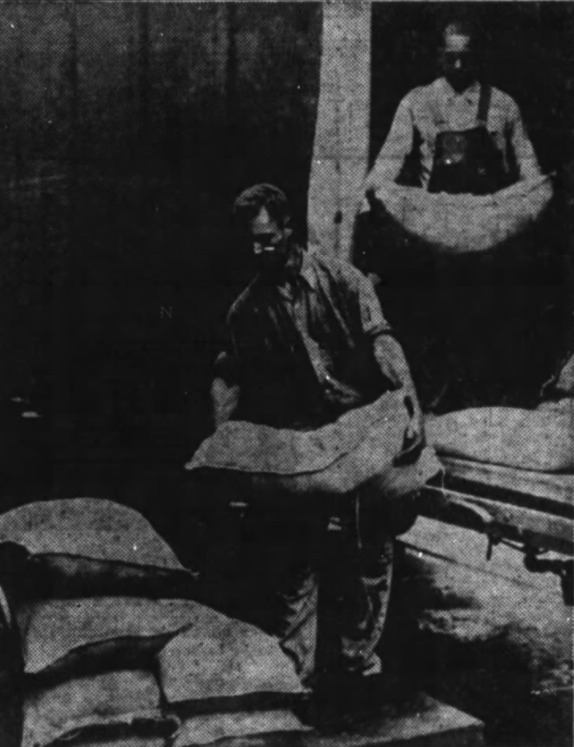 But many were hired by both companies and private individuals to perform manual, unskilled labor, such as loading and unloading trucks in Nashville’s mercantile neighborhoods. To be close to the limited work opportunities open to them, many workers lived in the adjacent Black Bottom neighborhood. This and the other "ganging" site across town did not have official legal status, but they were tacitly permitted by the city government as a necessary part of Nashville's economy. Molly Taylor-Poleskey, “Nashville's Oldest "Ganging" Place,” Bygone Nashville, accessed April 25, 2019, https://bygone-nashville.mtsu.edu/items/show/10. Cecil Jones, "Negroes Conduct Own Job Bureaus At Corners Here," Tennessean (Nashville, TN), Oct. 18, 1936, p. 45. Kyriakoudes, Louis M. "Southern Black Rural-Urban Migration in the Era of the Great Migration: Nashville and Middle Tennessee, 1890-1930." Agricultural History 72, no. 2 (1998): 341-51. http://www.jstor.org/stable/3744386.